I don't know why I have hate on my face in this photo. October 8, 2015 — I assume missing your head means that eating is—I’m just going to say it—off the table. 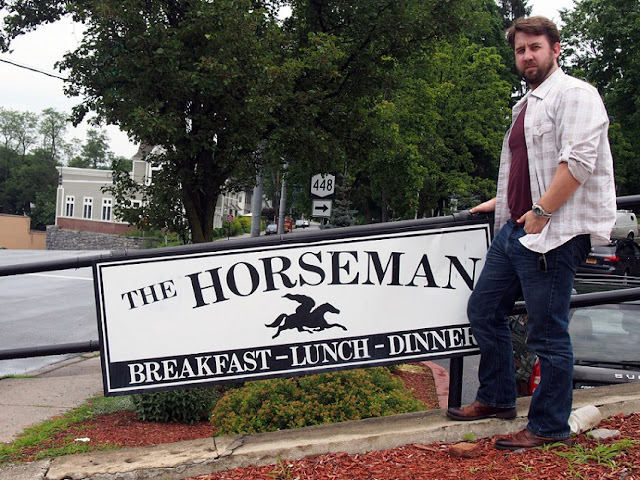 And that’s too bad for the Headless Horseman of Sleepy Hollow, because he has a restaurant named after him in the village where he—I’m just going to say it—is a legend. Called The Horseman, the restaurant is a small diner/pizza joint at 276 North Broadway, about half a mile up the road from the Old Dutch Church and the site of the Headless Horseman Bridge. Washington Irving published The Legend of Sleepy Hollow in 1820. He set the story in a real area of the Hudson Valley and used actual landmarks. The area may or may not at the time have been called Sleepy Hollow. Nobody’s sure where that name came from. Irving may have made it up, or it might have been a locally used designation. Irving dug the place so much that he moved there himself. Was even buried there behind the church he made famous in the story. That area became North Tarrytown, that is, until 1997, when it changed its name to, yup, Sleepy Hollow and started celebrating the story and the spook exactly like they should, preserving the landmarks, creating new ones, and throwing a great Halloween Season. Now you can’t walk ten feet downtown without seeing the image of a headless horse rider. It’s glorious. The perfect place to go in the Fall. And, as many of you know, I try to get there about every season. But this year, I knew I wouldn’t make it there for Fall, so I went early, during the Fourth of July weekend. That’s right. I mixed red, white, and blue with black and orange. 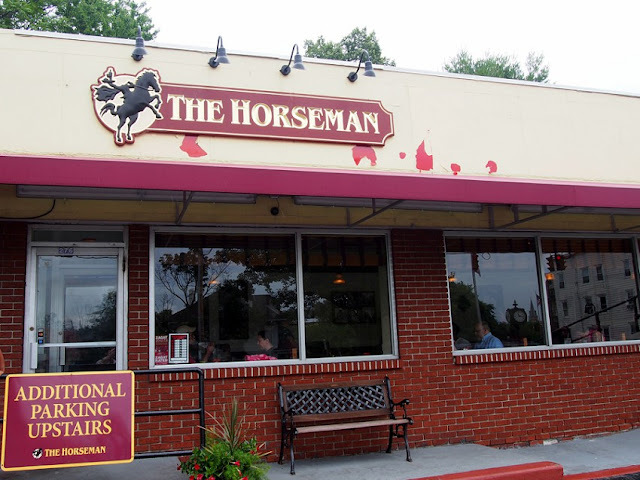 While there, we realized that we’d never eaten at the Horseman. I’m not sure why. 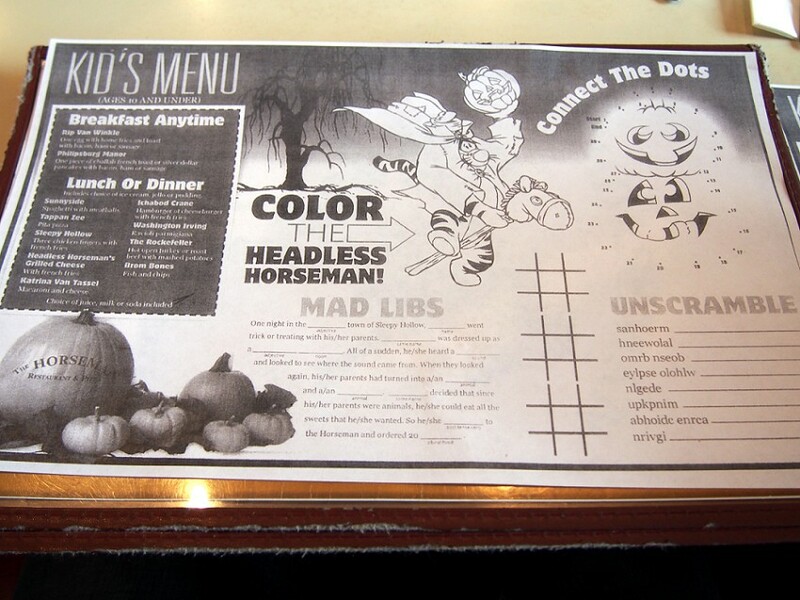 It is, after all, the village’s only spook-themed restaurant, holding that title since it opened in 1989. So we parked in the small lot on the hill behind it and headed in. It’s a tiny place. Like the size of a trailer. Also shaped that way, long and thin. Your basic diner. Now, diners are at their best when they’re nothing special. You get predictable food at a cheap price and an extremely casual ambiance. And that would be true of the Horseman. I mean, we sat in a vinyl booth beneath drop ceiling tiles eating nondescript burgers and a massive slab of meatloaf. Nothing really to bring up in conversation, much less post about. Except that everywhere we looked was a demon from Hell. 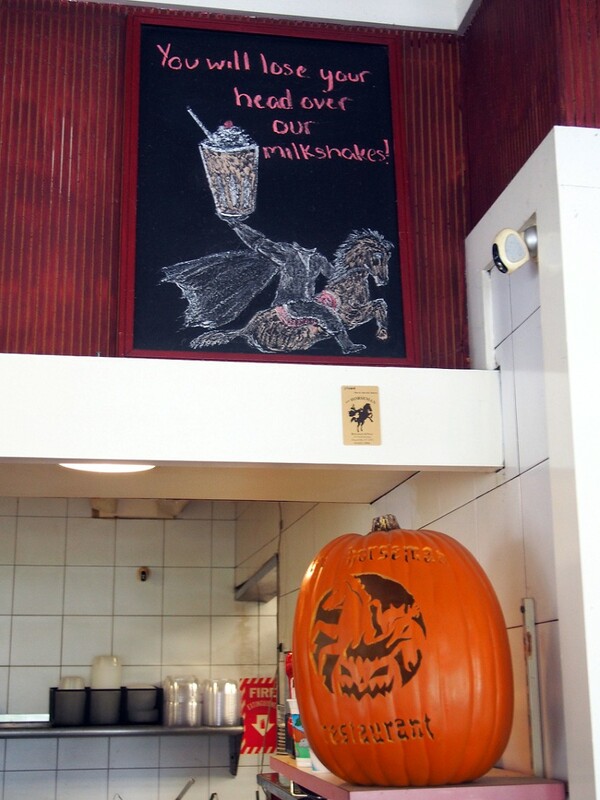 The headless Hessian was on the chalkboard advertising milkshakes. He was on a mirror at one end of the restaurant. He was on the menu. He was on the children’s coloring placemats (one of which, I nabbed for myself, of course). And on the wall near the restroom was a framed poster from Tim Burton’s Sleepy Hollow and a Todd McFarlane deluxe action figure from the flick. The face of their business has no face. 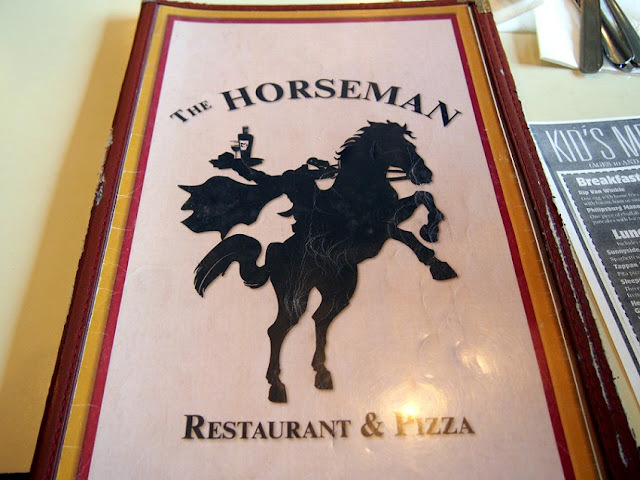 So, basically, what I’m saying is, The Horseman’s the perfect place to dash into after you’ve been to Sleepy Hollow Cemetery to scope out Irving’s grave or after you’ve traced the route of Ichabod Crane’s flight or just driven past the high school to see for yourself what an awesome mascot it has. 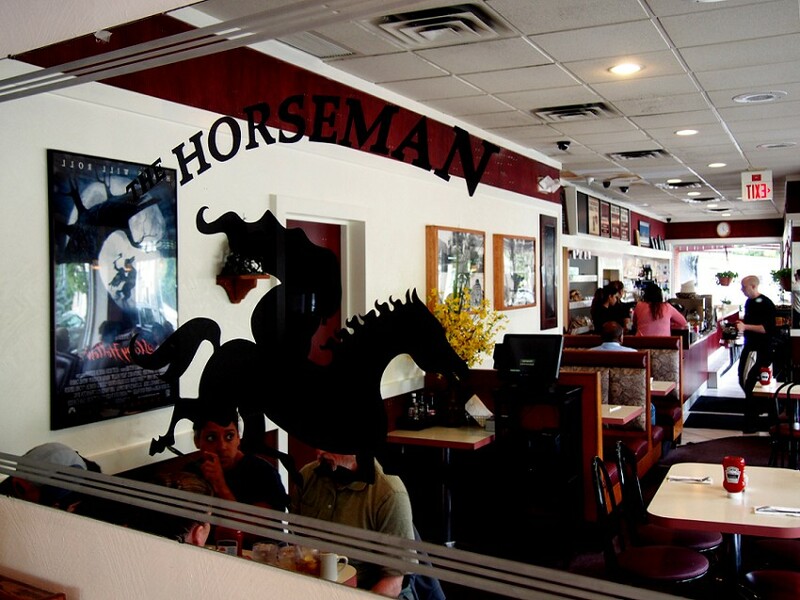 But what I kept thinking as I looked out the large windows onto North Broadway, was that in the quarter century that this diner has served this village famous for its fictional frightmare, The Horseman must’ve seen some serious Halloween.